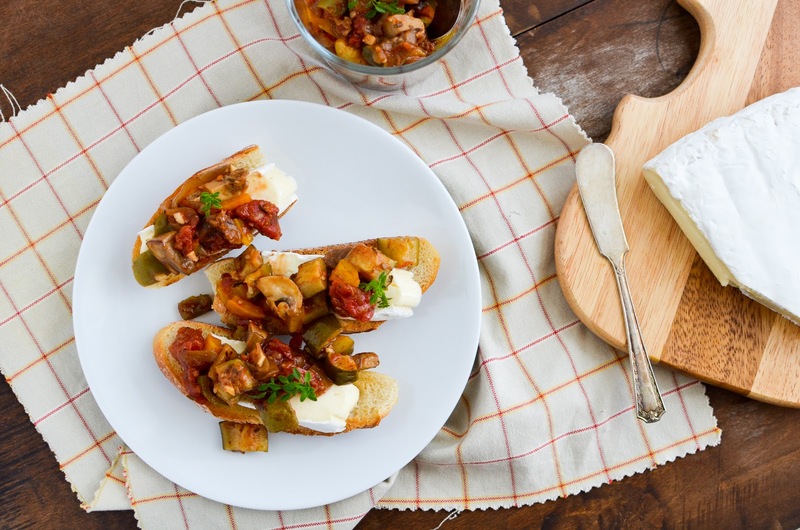 I confess, whenever I think of "ratatouille," the first thing that comes into my mind is the movie, rather than this delicious dish. Is it the same for you? I can't help it, being that I didn't even know what ratatouille truly was until well after seeing the film. But now that this dish of sauteed eggplant, bell pepper, onion, zucchini, and tomato is growing on me, visions of animated chefs are thankfully receding and my mind tends more towards thoughts of Provence, from whence ratatouille hails. Each ingredient is sauteed separately, consistent with French "Chef of the Century" Joël Robuchon's recommendation, ensuring that the vegetables retain their distinct flavors and characteristics. They are then combined and simmered together until they meld into one united dish. 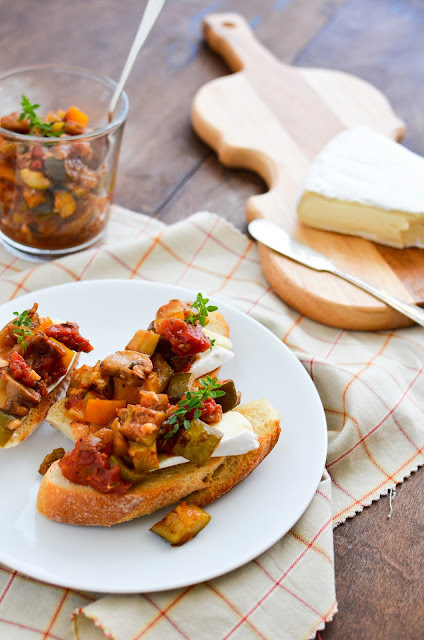 Ratatouille can be eaten as a side dish, or it can be the main part of a delightful vegetarian meal, serving it over pasta, potatoes, or bread. And it's a great way to eat your vegetables! My family and I enjoyed it very much for a simple lunch recently, spooned over crusty slices of toasted baguette and a smear of soft brie cheese. 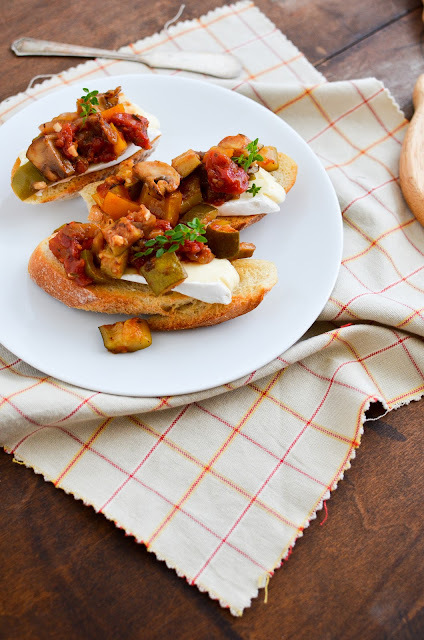 These ratatouille open-faced sandwiches would make a fantastic addition to a spread of appetizers, or a savory part of a brunch. Just thinking about the sweet and tangy, soft vegetables over some good, crunchy bread is making me hungry for more! Place diced eggplant in a colander and sprinkle with 2 tsp. salt. Let drain for 30 minutes. Meanwhile, working in batches, prepare the vegetables: heat a few tablespoons olive oil in a large skillet over medium-high heat and sauté the diced zucchini, then the bell pepper, then the diced mushroom, transferring cooked vegetables to a work bowl to keep warm, and adding more olive oil in between batches as needed. Sauté the sliced onion, and when onion is soft, add the minced garlic and cook for about a minute. Deglaze the pan with white wine, scraping up any browned bits from the bottom of the pan, and then add the diced tomatoes and herbs. Stir the sauce to combine the ingredients well and bring to a boil, then gently fold in all the sautéed vegetables and cover pan. Lower heat and simmer vegetables for about 30 minutes, stirring occasionally, to allow flavors to meld. Season with balsamic vinegar and salt and pepper to taste. As a serving suggestion, thickly cut French bread and toast the slices. 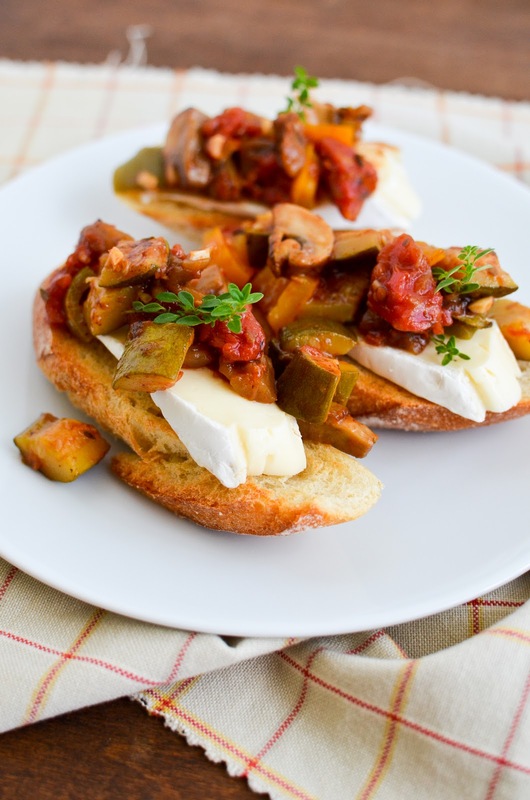 Spread toasted slices with a soft cheese such as brie or chevre and spoon ratatouille over. 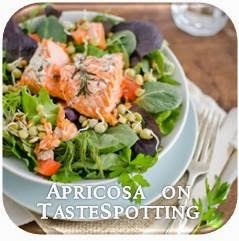 Makes a delicious open-faced sandwich for lunch or snack! This looks great! Lovely pics! I'm not even going to pretend otherwise: I didn't know what ratatouille was either until I watched the movie in French class. This looks like it'd make a really great lunch. So simple a twist on ratatouille, but so delish! I love the idea of soft lumps of Brie alongside too! All it needs is a nice red wine!